J.K. Rowling‘s Harry Potter prequel Fantastic Beasts and Where to Find Them will be hitting the big screen November 18 2016, and so far it’s shaping up to be amazing. Last year Entertainment Weekly got the inside scope with some incredible photographs from the set of the film, and since then, even more information has been revealed. Here is everything we know about Fantastic Beasts and Where to Find Them. There will be 5 films in the Fantastic Beasts franchise. J.K. Rowling recently confirmed that Fantastic Beasts and Where to Find Them is just the first of five films. We are literally beside ourselves with glee!! The trailer tells us a lot. The trailer opens just like Harry Potter and the Prisoner of Azkaban with Newt Scamander casting the Lumos Maximos spell. That’s not the only thing that seems familiar, from the growl that comes out of Newt’s suitcase when he opens it briefly, it looks as though the basilisk may be making an appearance (There are also some scales in the title cards that remind us of the gigantic snake.) Overall, the trailer doesn’t tell us much about Fantastic Beasts, however we are pleased to see the return of Hermione Granger’s Undetectable Extension Charm and to see what the American Wizarding World looks like. Fantastic Beasts and Where to Find Them is mentioned only once in the Harry Potter franchise. In Harry Potter and the Sorcerer’s Stone, Harry goes with Hagrid to Diagon Alley to pick up his school supplies. On his textbook list, he finds Fantastic Beasts and Where to Find Them by Newt Scamander. Newt Scamander, who will be played by Academy Award winner Eddie Redmayne, is a “magizoologist” from England, living in New York City in 1926. Little is known about Scamander thus far, but here is what we do know. He was born in 1897 and is obsessed with fantastic beasts. His mother “was an enthusiastic breeder of fancy Hippogrifs”, which can probably account for his interests. Scamander was a Hufflepuff while at Hogwarts, and he had various jobs over the course of his life including, the Ministry of Magic in the Department for the Regulation and Control of Magical Creatures. The Office for House-Elf Relocation and in the Beast Division where he created the Werewolf Register in 1947 and the Ban on Experimental Breeding, “which prevented the creation of “new and untamable monsters within Britain.” He also worked for the Dragon Research and Restraint Bureau for a time. What’s the deal with the American Wizarding world? J.K. Rowling broke the internet this week when she revealed that muggles in the US are actually called “no-maj”. You are probably still reeling from that nugget of information, but there is more. The United States also has it’s own Ministry of Magic. In America its called the Magical Congress of the United States of America (MACUSA), and it is located in the Woolworth Building in lower Manhattan. When he arrives in America, Newt Scamander realizes that the American Wizarding World is hiding from muggles and that the “the threat of public exposure is an even graver concern than in the U.K.” Scamander brings a beat up old briefcase with him to the States, which is very similar to Hermione’s beaded handbag in that it’s not exactly what it seems. 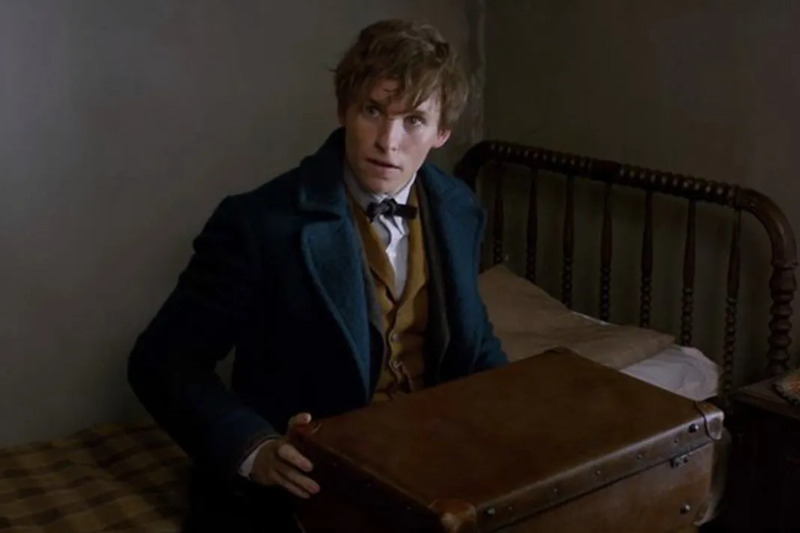 In that bag, Scamander is carrying around rare and endangered magical creatures and their habitats, from his travels across the globe. Everything is gravy until Scamander’s creatures escape from their case. More deets on the film. Fantastic Beasts and Where to Find Them is J.K. Rowling’s first screenplay and it will be directed by David Yates who directed the final four Harry Potter films. Aside from Redmayne, the other stars in the film are, Katerine Waterston as Porpetina “Tina” Goldstein, Allison Dusol as Queenie Goldstein, Dan Fogler as Jacob Kowalski, Colin Farrell as Graves, Samantha Morton as Mary Lou and Ezra Miller as Credence. Most Importantly, will the film crossover with Harry Potter in any way? Not exactly, after all Newt Scamander lives 70 years before Harry’s time. However his grandson Rolf Scamander does marry Luna Lovegood, Also, Emma Watson had publicly stated that she will be totally down for a cameo. That is everything we know about Fantastic Beasts and Where to Find Them thus far, we’re sure we will get way more information on the film over the course of the next year. Until then, it’s probably a good time to reread the HP entire saga and then have a Harry Potter movie marathon. You can also pick up your own copy of Fantastic Beasts and Where to Find Them at a no-maj bookstore near you.